The Exhibition has been extended until Saturday the 16th February 2019. The exhibition presents the works of the cartoonist Giovanni Timpano, who has been working for the American comic market for the last few years. With his pencil he has created the stories of some of the most famous characters of the genre: for example, Batman, The Shadow, Lone Ranger, Doc Savage and The Avenger. On display there are more than 50 illustrations and covers, drawn by Timpano for the most important American majors. 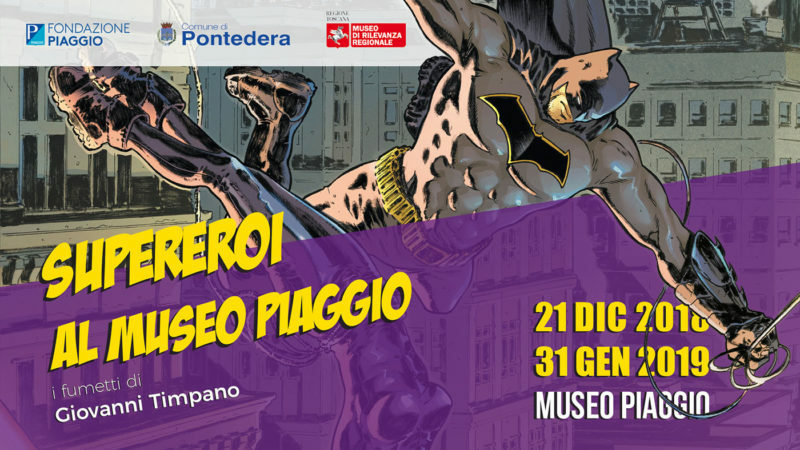 The exhibition starts from about twenty precious and original drawings of the 2018 mini-series The Shadow/Batman, where the two beloved superheroes are side by side. There is also a section devoted to the explanation of the artistic process that leads to the creation of the final tables. In fact, the sketches, the Indian ink phase and the coloring one, made by a colorist, are shown. Furthermore, in another room the documentary “Non smettere di disegnare (Don’t stop drawing, 2015)” of Giacomo Becherini is projected. The film investigates the artistic path which ends with the realization of a drawing, starting from the personal experiences of the professionals who work in Tuscany, as Daniele Caluri, Alberto Pagliaro, Tuono Pettinato, Stefano Casini, Giovanni Timpano, Francesco Ripoli e Maddalena Carrai.